India does not have a Thanksgiving tradition. But then, tradition or not, what's the point in ignoring a festival devoted almost entirely to eating and shopping. As a vegetarian, the turkey meal at thanksgiving is not of much interest to me. But there are so many sides to pick from and so many variations on the pumpkin. So for today's thanksgiving special, I bring you a bread roll that's not only shaped like a tiny, squat pumpkin but is also chock full of pumpkin puree and flavour. The pumpkin bread was the bread of the month at my bread baking group 'We Knead to Bake'. Every recipe I have baked with this group has been a winner and this is no exception. The rolls that come out of the oven are super soft and amazing with a pat a butter. Plus the house smells of cinnamon and ginger and nutmeg for hours. The original recipe makes 8 rolls but I halved it so the one below makes 4 tiny pumpkins, just enough for 1-2 people. The moment you mention to someone that you are a Punjabi and a foodie, you are likely to hear one of the two things in the sentence that follows: 'Butter Chicken' or 'Sarson ka Saag'. Of these two iconic dishes, butter chicken is a year round phenomenon and of little interest to me as a vegetarian. But let's talk of sarson ka saag or mustard greens that are just coming into season and will be a staple diet in Punjab for the next three months. The last few days, my drive back from work has been brighter than usual with buildings and malls all lit up. The markets are all full of people scrambling for last minute gifts. And any minute now, the air will get thick with smoke of firecrackers, the sky will light up with shooting stars. No wonder then, that Diwali is my favourite time of the year. We are at that time of the year that's the cusp between summer and winter. It never really gets too cold in Mumbai but the air will start getting a little nippy in the evenings soon. Even when everyone is starting to talk about pumpkins and gingerbread, right now it feels too early to let go of the bright fruits and vegetables of the summer. Which is why this panacotta is a perfect dessert. The panacotta itself is the 'warm' and wintery element in the dessert, full of cinnamon and nutmeg and ginger. To complement the creamy panacotta, I have added two more components. Well, three if you count the fresh pomegranate seeds. In addition to the pomegranate seeds, there is a pomegranate syrup, made fresh at home and tangy enough to cut through the panacotta's sweetness. The final element - the chocolate soil - provides the much needed textural contrast. For the past many years, any time I am near a Theobroma patisserie, I get myself a pain au raisin. Buttery, flaky and full of raisins, it's the best Danish there is. Then, a few months back, Theobroma suddenly stopped baking my favourite pastry. I was so disappointed, I ranted and raved on Twitter. Five minutes later, the owner of Theobroma tweeted back, offering to bake pain au raisin for me on special order. We exchanged some mails, picked a date, and she even coordinated with her store and the central kitchen to make sure I got my treats. In my home, you don't mess with my mom's kadhi chawal recipe. For starters, it is just about the best version of kadhi you will taste. Plus it's pretty near perfect, with the right amount of tang and spiciness. But there's one thing I've been thinking of trying for a while, and that is to use the techniques of making tempura to make a crisper version of the pakoras. It's just a couple of tweaks really, but they somehow make the pakoras a lot crisper to bite into. And once you dunk them in the kadhi and wait 15-20 minutes, you get soft pillows that absorb all the kadhi flavours. You never hear a lot about Parsis if you are in North India. But living in Bombay, you can't help but notice this charming group of people. Known for their vintage cars and quirks, their sense of humour and generosity, the Parsi community has left it's mark on pretty much everything that defines Bombay. Nothing defines Parsis better than their love of good food. 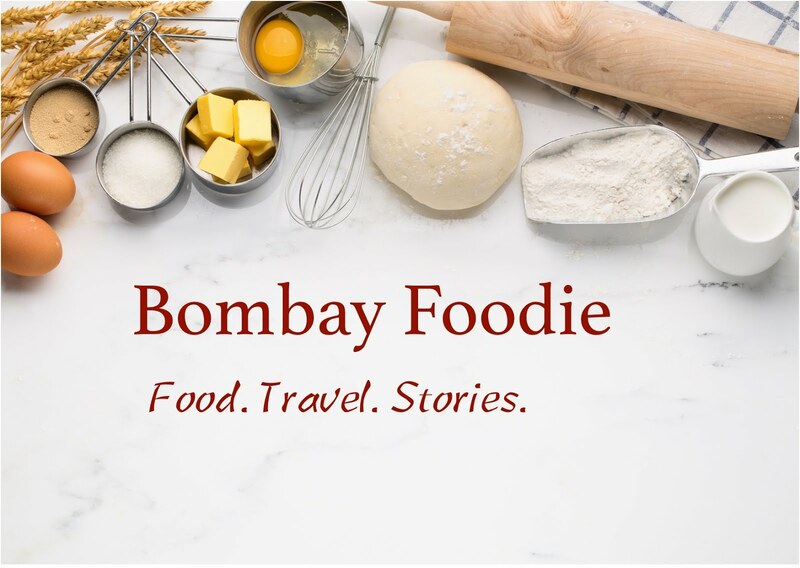 I've had the fortune to meet several Parsi friends and foodies in the years I've spent in the city and come to love their delicious dishes including the famous berry pulao at Britannia and dhansak at countless Parsi cafes around town. But there is one thing no self respecting Parsi will be caught dead with; and that is vegetarian food. So when I got an invite to try out the Parsi food festival at not one but two restaurants, this vegetarian foodie took it on as a challenge. Every year, in the middle of summer, it's pickle season at my home. Usually my mom's the cook in the house but pickle day is one of the five or six times a year my dad chips in. Either he or my brother will bring the mangoes home, as well as the spices and then the day long process of drying and mixing will begin, followed by many days of curing the pickle. This mango pickle is fairly standard in Punjab, which means that you can even get the mangoes pre-cut at the farmer's market and local spice stores sell premixes; you just tell them how many kilos of mangoes you got and they will hand over everything you need. At the end of my interviews with Sugarcrafters, I intend to ask them to share one of their signature recipes. Just so I can recreate some of that magic at home. When I asked Chef Deep this question, he didn't give me a recipe, he gave me a jar. Chef Deep introduced these DIY jars after he took over as the executive pastry chef for the Trident Patisserie for his customers to easily recreate his bakes at home. In fact, everything about these jars defines thoughtfulness and ease. The recipe is printed on the jar itself so you don't have to look around for any extra papers. There's even a wooden spoon attached to the jar to stir your batter and the jar itself will come in handy once you have finished baking your brownies so you can store the goodies. A few years back, a group of bakers started 'We Knead to Bake' - a monthly bread baking group. At that time, I was busy moving between countries and student life and work so I had to pass on the bread baking challenges. But I've been following the group's beautiful breads and finally, this month on, I've decided to join in as well. As luck will have it, the first bread I got to make wasn't baked but steamed. The group chose to make tingmos, a Tibetian/North East Indian steamed bread that's used to mop up everything from hot sauces to noodle soups to curries. The dough came together beautifully and even when risen, was one of the nicest doughs I have worked with.